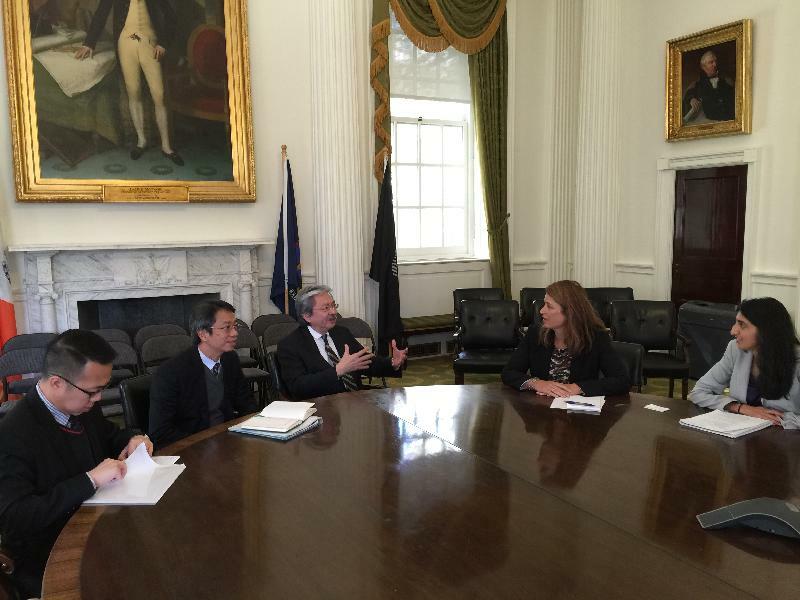 The Financial Secretary, Mr John C Tsang has started the last stop of his US visit in New York, where he is staying from October 8 to 12 (New York time), and promoted Hong Kong to the business sector in the US. 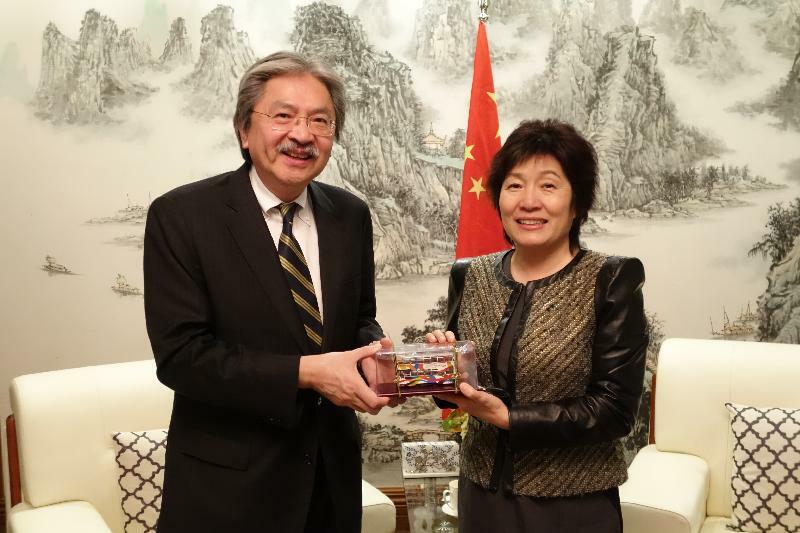 On Sunday (October 9, New York time), Mr Tsang met with some 50 members of the Chinese community at a lunch hosted by New York City Council Member Mr Peter Koo. He updated the participants on the latest economic and social developments of Hong Kong. 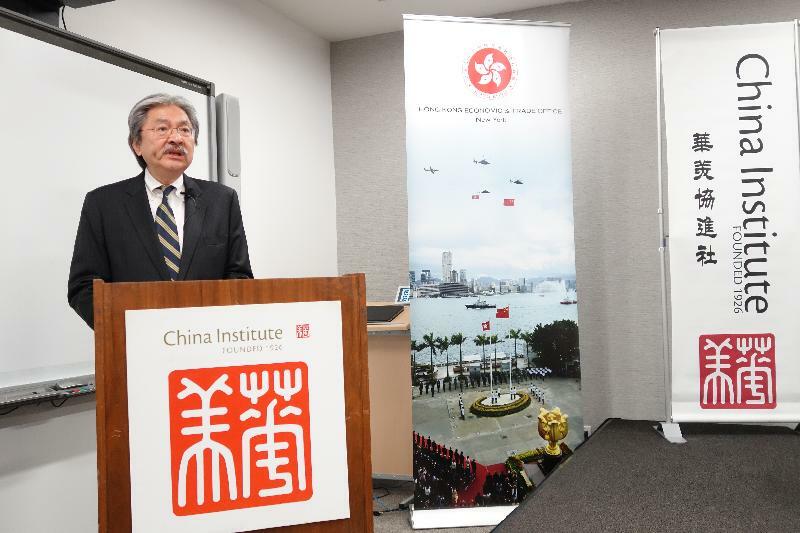 On October 10 (New York time) at a luncheon at the America China Public Affairs Institute, Mr Tsang spoke on the unique role that Hong Kong can play in helping Asia and China to fully realise their potential. He said, "Amid the persistent shift of the global economic centre of gravity moving from the West to the East, Asia will continue to be the major force of the global economic growth in the days to come." "Hong Kong is an international commercial, trade and financial centre that has been attracting investors and enterprises from every corner of the planet who are looking for good investment opportunities and looking to tap the ever-expanding Asia and China market. Hong Kong shall continue to expand our trading and commercial networks throughout the region with the emerging Asian economies. We are aiming to conclude the negotiations towards a free trade agreement between Hong Kong and the ASEAN bloc by the end of this year," Mr Tsang added. On October 11 (New York time) at a breakfast discussion organised by the Manhattan Chamber of Commerce, Mr Tsang highlighted the many advantages of Hong Kong's favourable business environment, including the free and open market, the rule of law, the strategic location at the heart of Asia, as well as our level playing field and simple and low tax regime. He later met with the Deputy Mayor of New York for Housing and Economic Development, Ms Alicia Glen, and exchanged views on diversifying the economy and developing emerging industries. Both sides agreed to strengthen co-operation on development of Fintech. He also had a meeting with the Executive Vice President and the Head of the Markets Group of the Federal Reserve Bank of New York, Mr Simon Potter, and discussed global economy outlook and other matters of mutual concern. While in New York, Mr Tsang called on the Permanent Representative of the People's Republic of China to the United Nations, Mr Liu Jieyi, and the Consul General of the People's Republic of China in New York, Ms Zhang Qiyue. On the evening of October 11 (New York Time) at the reception hosted by the China Institute, he spoke about Hong Kong's essential role in connecting the Mainland of China and the world. He said the inclusion of Renminbi in International Monetary Fund's Special Drawing Right currency basket, the continued opening-up of Mainland's markets to the world, as well as the grand and visionary Belt and Road Initiative, will create massive opportunities for Hong Kong. The China Institute, founded in the 1920s by scholars and educators, aims to promote a deeper understanding of China through programmes in education, business, culture and art. On October 12 (New York time), Mr Tsang will address a breakfast meeting organised by Invest Hong Kong and the Hong Kong Trade Development Council to promote Hong Kong as a hub for start-up and Fintech development. After concluding his visit in New York on October 12 (New York time), he will fly to Lima, Peru, to attend the Asia-Pacific Economic Cooperation Finance Ministers' Meeting.